1 A None No Power Seat 1 A is a standard First Class seat located at a bulkhead. The proximity to the galley and lavatory area might be bothersome. 1 C None No Power Seat 1 C is a standard First Class seat located at a bulkhead. The proximity to the galley and lavatory area might be bothersome. 1 D None No Power Seat 1 D is a standard First Class seat located at a bulkhead. The proximity to the galley and lavatory area might be bothersome. 21 A None No Power Seat 21 A is a standard Economy Class seat in the last row of the plane. Seat back recline might be limited. The proximity to the galley and lavatory behind might be bothersome. 21 B None No Power Seat 21 B is a standard Economy Class seat in the last row of the plane. Seat back recline might be limited. The proximity to the galley and lavatory behind might be bothersome. 21 C None No Power Seat 21 C is a standard Economy Class seat in the last row of the plane. Seat back recline might be limited. The proximity to the galley and lavatory behind might be bothersome. 21 D None No Power Seat 21 D is a standard Economy Class seat in the last row of the plane. Seat back recline might be limited. The proximity to the galley and lavatory behind might be bothersome. 6 A None No Power Seat 6 A is a standard Economy Class seat located at a bulkhead that Alaska Airlines classifies as "Premium Class" and may be selected for an additional fee. This seat has additional legroom due to the Bulkhead however, the tray table is in the armrest, making the armrest immovable and slightly reducing seat width. 6 B None No Power Seat 6 B is a standard Economy Class seat located at a bulkhead that Alaska Airlines classifies as "Premium Class" and may be selected for an additional fee. This seat has additional legroom due to the Bulkhead however, the tray table is in the armrest, making the armrest immovable and slightly reducing seat width. 6 C None No Power Seat 6 C is a standard Economy Class seat located at a bulkhead that Alaska Airlines classifies as "Premium Class" and may be selected for an additional fee. This seat has additional legroom due to the Bulkhead however, the tray table is in the armrest, making the armrest immovable and slightly reducing seat width. 6 D None No Power Seat 6 D is a standard Economy Class seat located at a bulkhead that Alaska Airlines classifies as "Premium Class" and may be selected for an additional fee. This seat has additional legroom due to the Bulkhead however, the tray table is in the armrest, making the armrest immovable and slightly reducing seat width. 7 A None No Power Seat 7 A is a standard Economy Class seat that Alaska Airlines classifies as "Premium Class" and may be selected for an additional fee. 7 B None No Power Seat 7 B is a standard Economy Class seat that Alaska Airlines classifies as "Premium Class" and may be selected for an additional fee. 7 C None No Power Seat 7 C is a standard Economy Class seat that Alaska Airlines classifies as "Premium Class" and may be selected for an additional fee. 7 D None No Power Seat 7 D is a standard Economy Class seat that Alaska Airlines classifies as "Premium Class" and may be selected for an additional fee. 8 A None No Power Seat 8 A is a standard Economy Class seat that Alaska Airlines classifies as "Premium Class" and may be selected for an additional fee. 8 B None No Power Seat 8 B is a standard Economy Class seat that Alaska Airlines classifies as "Premium Class" and may be selected for an additional fee. 8 C None No Power Seat 8 C is a standard Economy Class seat that Alaska Airlines classifies as "Premium Class" and may be selected for an additional fee. 8 D None No Power Seat 8 D is a standard Economy Class seat that Alaska Airlines classifies as "Premium Class" and may be selected for an additional fee. Portable Media Players - digEPlayer - are available on some flights. These media players are available for a fee and may be reserved online. Rentals are free of charge for First Class passengers. 110V AC Powerports and USB ports are available at every seat in First Class. 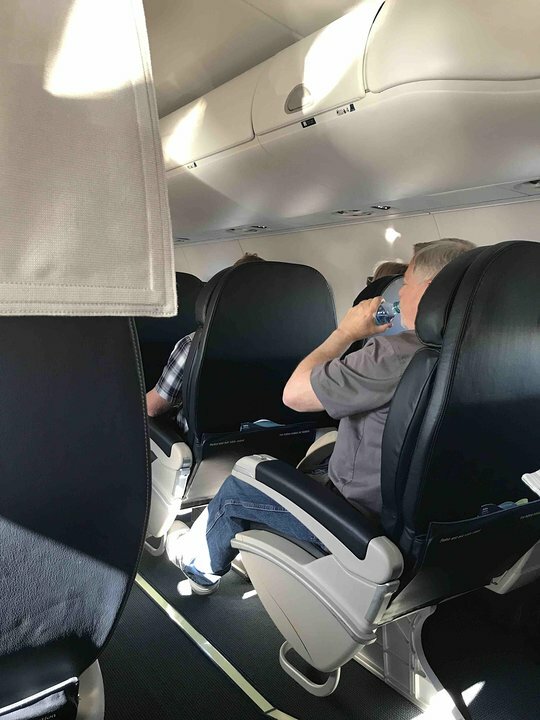 Operated by SkyWest, this aircraft is designed for short to mid-range flights, the Embraer 175 features 76 comfortable seats, with no middle seasts, every passenger has either a window or aisle seat. This seat has no seat in front of it. Although it has an incredible amount of legroom, you have no under seat storage, and because the aisle angles, you may be bumped by other passengers as they move about. Good standard economy seat. 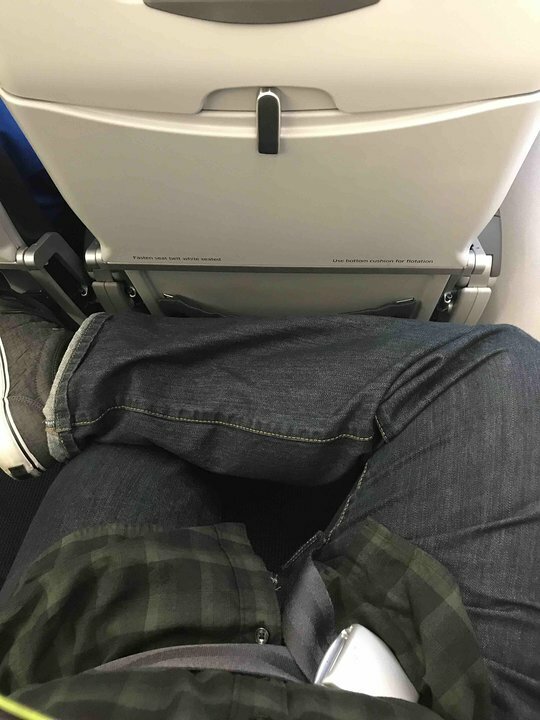 I am 6'4" and 275 lbs and had plenty of room in the waist/hips as well as enough leg room (even with my backpack under the seat in front of me). This was the worst seat I have ever experienced in many years of plane travel. Back was uncomfortable and curved the wrong way. Overhead luggage area was so small about 1/3 of travelers had to have their baggage taxed delaying the trip. Traveled on second day as first day the plane could not take off from LAX. 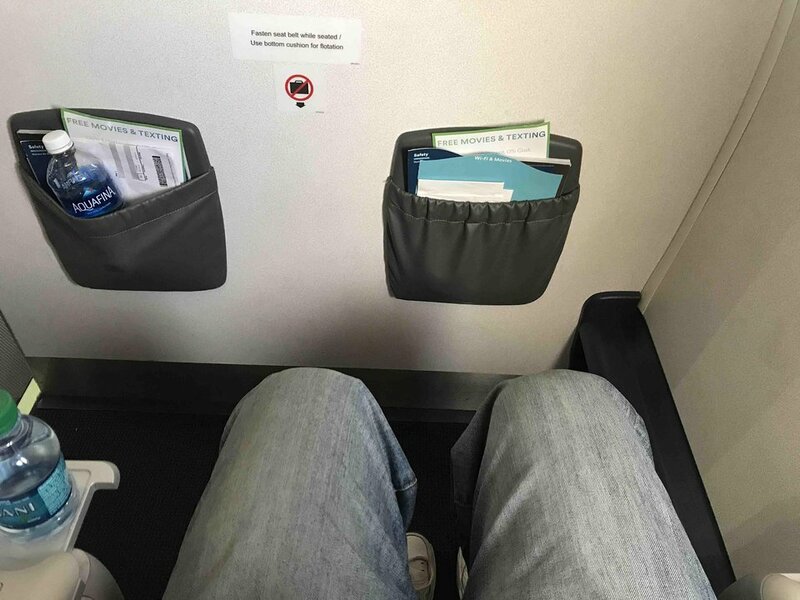 Seat is comfortable, good leg room for me at 6'0". I used a computer backpack for a weekend bag and it would not fit in the overhead, but it did fit under my seat. Overhead bin on opposite side does have ample room if I wanted it. Twice on this flight I used the lavatory and both times I was greeted with an unflushed toilet. I don't think the rubes in first class that day knew the flush button in on the lower right bulkhead. The cabin speaker is directly overhead, and is very loud. I wouldn't sit in this seat without headphones, or if I was planning on sleeping. This is simply a great seat. Solo seating on a plane not much smaller than a 737. The jet itself is fast and comfortable. The only complaint I have is that on my route (SEA / SJC) I have only had the opportunity to fly in this plane once. The normal plane is a 737/800. Comfortable seat, however the window is misaligned and difficult to see out of. Massive legroom and because no bulkhead, under seat storage. The seat and legroom were comfortable. 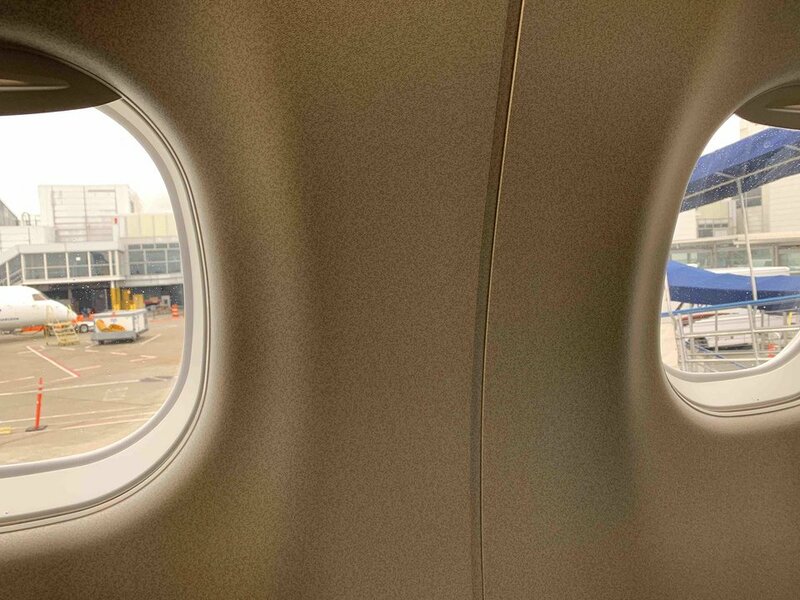 The window is misaligned with the seat, however, making it difficult to look outside. E175 coach. 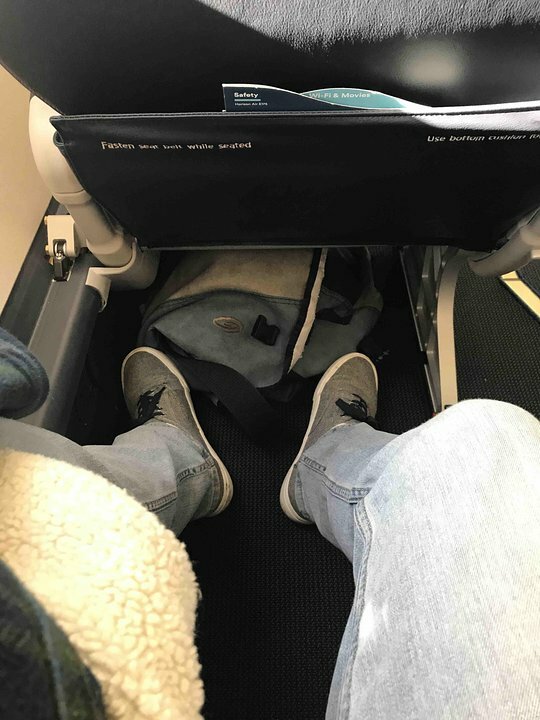 18 wide and leg room for 61 guy. Overall the coach seat is comfortable and thats not an upgraded aeat!! Lots of room and not cramped with bulkhead. Power in seat. Great seat. Lots of leg room. Power in seat. Galley is so small theres really no noise. This is one of the few opportunities in all of air travel to have a solo seat. This is valuable if you want to do work on confidential client materials. Seats 2A and 3A are just as good. Well worth the cost of an upgrade to first class if you want to do some work on your flight. These seats have as much legroom as Economy plus. Standard econ seats. These seat backs are not very comfortable. They are both thin and firm. Window placement in row 18 is centered perfectly, unlike row 16. Decent seat but please note that in row 12 the windows are not centered to your section. The reduced seat width was not a problem at a cost for the extended legroom. Great seat. The few dollars that it cost for the preferred plus seating was money well spent. The legroom in regular coach is OK, but in the plus section it is great. The seat was wide and comfortable. The only down side is that the window is badly misaligned. If you have a choice of flying on this or the Q400, the other regional plane that Alaska uses, take the E175 every time. This plane is 10 times more comfortable. These new E75 are fantastic. Practically a Boeing 737. The First Class seating is WAY to comfortable for a regional jet. I am definitely a FAN! Traveling between BUR and PDX, these Embraer 175 are simply awesome. For that they are considerable spacious, comfortable and the Wifi makes flight time a breeze! Although it was a very short flight, I had an overall great experience. There was plenty of legroom. The only negatives were that the window was misaligned and the overheads were pretty small. The trays in the First Class seating are all stored in the armrest. This leaves little room for a larger passenger to have room between the edge of the tray and your belly when the tray is in use. I had seat 3D for my return flight from MSP to PDX. I was in 2A to MSP. I found 3D to feel more spacious than 2A even though the A seats are "singles". The overhead bins are much larger on the C & D side. Biggest plus: power is at the seat! Comfortable seat & very good/attentive service. Was concerned being on this smaller aircraft from PDX - MSP but it was fine. Sat in first class & the service was excellent. Seat more comfortable than expected. Alaska Airlines flies 1 versions of Embraer 175.